The Oklahoma City Thunder are finally above .500 following a 94-86 win over the Miami Heat with Kevin Durant and Russell Westbrook doing just about enough but not really impressing, mostly relying on their defense to seal the deal. Kevin Durant shot just 9-of-24 from the field including 0-of-8 from beyond the arc to score 19 points. 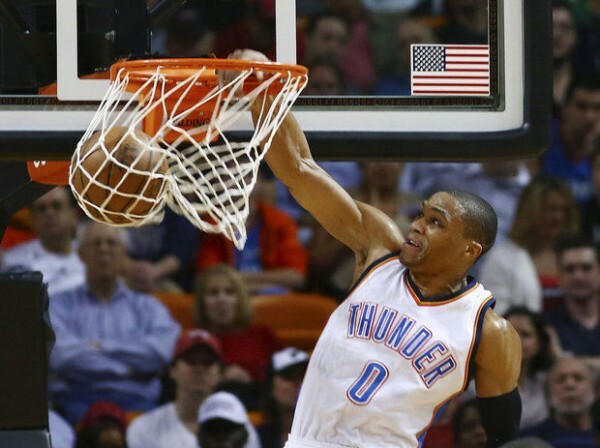 Russell Westbrook was uncharacteristically the more accurate one, scoring 19 points on 8-of-17 from the field. Obviously, after a few wins, speaking to Ernie Johnson, Westbrook was more than happy to be asked questions. It all depends on whether he likes the reporter or not, or simply if that journalist or media persona has ever dared criticize him in the past. So how good do the Thunder need to be in order to make the playoffs? Based on the last five seasons, the 8th seed in the West averages 48 wins. The Thunder, at 21-20, will need to go at least 27-14 in order to reach that mark. Their record with Kevin Durant healthy this season? They’re 12-6 with him so far, which means they’re more or less on pace to just beat the required mark. but Durant might look a bit less rusty unless more injuries get in the way. But just making the playoffs isn’t going to be enough. There’s also the need to get home court advantage. A number four seed on average has 54 wins, which means going 33-8 the rest of the way. Only two teams – The Atlanta Hawks and the Golden State Warriors have 8 losses or less through the first half of the season. And getting the number one seed in the conference? The average is 61 wins. That means going 40-1 from here on out. Not going to happen. The Miami Heat continue to be quite easy to beat at home, falling to 7-13. While it’s hard to see them not making the playoffs , that is a growing possibility in likelihood, more than once finding it very difficult to get a solid scoring production from more than one or two players. If Hassan Whiteside is injured for more than a short, minor period, their scoring inside could once again become a very serious and costly problem.